Want to check out the newest offerings from some of America’s coolest and trendiest startups? 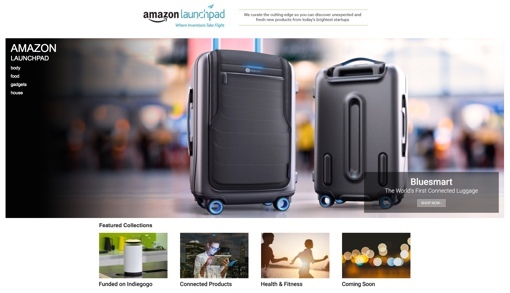 Today, Amazon has launched a new storefront called Amazon Launchpad, a curated selection of approximately 200 new products in a wide range of categories. Indeed, Amazon Launchpad has an interesting selection of items. Currently, it offers Bluetooth-enabled luggage from Bluesmart ($349), the smartphone-connected Kinsa Smart Thermometer ($29.99) and the littleBits Electronics craft kit for programming-minded kids ($99.00). There’s even a canister of powdered camel milk if you’re feeling truly adventurous ($120.00 for 14.8 ounces). The only catch: Many Amazon Launchpad items are pre-orders, so it may take a while to get your order fulfilled. To visit the Amazon Launchpad store, visit amazon.com/Launchpad . You might also want to check out Amazon Exclusives – it’s a curated selection of exclusively offered merchandise from up-and-coming brands.